Dr Jo Harding (Helen Hunt) is an Oklahoma meteorologist who has dedicated her career to chasing down and measuring tornadoes. On the day she and her team are set to test their revolutionary recording system, nicknamed “Dorothy”, Jo is met by her estranged husband Bill (Bill Paxton) who has come to force her to sign their divorce papers. Rather than sign, she drags him along to finally test the work they both dedicated their lives to complete – while competing with a corporate-funded rival (Cary Elwes) who has stolen their research. 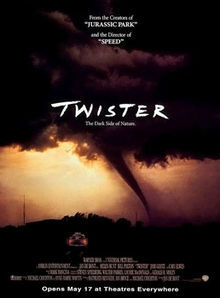 Twister, directed by Jan de Bont and released back in 1996, is a high-concept visual effects picture. ‘High concept’ because it is based on an idea that the largest possible audience can understand, and ‘visual effects’ because the tornadoes that feature throughout the movie are pretty much the primary selling point of the entire movie. Audiences were not encouraged to see a rekindled romance between Hunt and Paxton’s characters, or to engage with any individual or collective group of characters. The film is entirely about how cool it looks to see a tornado smash through a farmhouse, or shred a field of corn, or throw up and spin cows in the air for minutes at a time. That is no bad thing, but it’s key to appreciating a film like Twister to separate what the film is from what it is not. It is the movie equivalent of a roller coaster ride: a series of sharp and thrilling turns separated by a more relaxed segments to catch your breath and appreciate the more dramatic bits when they come. For that to work at its best in film, you need appealing but uncomplicated characters with whom you can immediately root for, and you need well-crafted visual effects sequences produced with care and integrity. In the latter respect Twister acquits itself admirably. Jan de Bont was a well-regarded cinematographer well before he segued into directing, and that experience has ensured that his films like Twister are shot with a very strong visual eye. Working with his own director of photography Jack N. Green, de Bont establishes a visceral sense of the tornadoes’ power and destructive capacity. When combined with exceptional sound design and well-crafted digital effects, it all pulls together into an exciting and dramatic series of set pieces. The film is 22 years old, but because the visual effects and sound design were put together so effectively in the first place those elements still work on a dramatic level today. When it comes to its characters, Twister struggles a little. It does boast a neat cast of easy-to-remember, individually distinguished supporting characters, played by the likes of Philip Seymour Hoffman, Alan Ruck and future writer/director Todd Field. On the other hand, it effectively throws Bill’s new fiancee Melissa Reeves (Jami Gertz) under the bus. She’s nervous, she’s almost willfully naive, and she is scripted in such a one-sided manner as to make Bill’s reunion with Jo openly inevitable. Her best moment comes when she leaves, calmly telling Bill she knows she cannot compete with Jo and leaves him by the food stand of a drive-in theatre. In her exit, Melissa is finally granted a shred of dignity. Another element that is sorely undercooked is Cary Elwes’ smug, oily meteorologist rival Jonas. Elwes is stuck playing the role as a one-dimensional moustache-twirling villain, designed to give Bill a narrative reason to rejoin Jo’s team and to allow Bill to look smarter and more competent at regular intervals. The film simply doesn’t need Jonas – the tornadoes are honestly enough – and his ultimate demise feels shoe-horned in and unnecessary. Despite its faults, Twister does satisfy as a popcorn-fuelled amusement ride. Hunt and Paxton add a lot of charisma and appeal, and that lifts up the fairly risible dialogue (courtesy, somewhat astonishingly, of Michael and Anne Crichton, Joss Whedon, Steve Zaillian and Jeff Nathanson). Its tornado sequences continue to impress. It’s all about expectations in the end: given what the film was made to do, it still more than satisfies. I know I saw the movie (though probably on a small screen), but remember only one bit of dialogue and a couple of visuals, and had completely forgotten that there was a love triangle ‘plot’. Still, it’s hardly Jan de Bont’s worst directorial effort. That’s the beauty of The Haunting. No matter what de Bont makes for the rest of his life, it will almost certainly not be the worst thing he’s ever done.